As usual, we followed the same selection process as with previous editions of the awards, based on a typical peer-review process involving a three-stages process of initial filtering, then shortlisting and reviewing where each paper is evaluated by at least three experts in corresponding fields and marked on the basis of scientific excellent, originality, rigour and potential impact. One paper and 4 Honourable mentions in each category of nomination were chosen on this basis. Boudjemâa, Abdelâali. “Collective modes of a one-dimensional trapped Bose gas in the presence of the anomalous density.” Physical Review A 94.5 (2016): 053629. Lahmar, Halla, et al. “Effect of the thickness of the ZnO buffer layer on the properties of electrodeposited p-Cu 2 O/n-ZnO/n-AZO heterojunctions.” RSC Advances 6.73 (2016): 68663-68674. Mostafa, Laoues, Khelifi Rachid, and Sidi Moussa Ahmed. “Comparison between beta radiation dose distribution due to LDR and HDR ocular brachytherapy applicators using GATE Monte Carlo platform.” Physica Medica 32.8 (2016): 1007-1018. Chebaki, E., et al. “Improved analog/RF performance of double gate junctionless MOSFET using both gate material engineering and drain/source extensions.” Superlattices and Microstructures 92 (2016): 80-91. Ziadi, Raouf, Abdelatif Bencherif-Madani, and Rachid Ellaia. “Continuous global optimization through the generation of parametric curves.” Applied Mathematics and Computation 282 (2016): 65-83. Bouzidi, Amira, et al. “Association between MDR1 gene polymorphisms and the risk of Crohn’s disease in a cohort of Algerian pediatric patients.” Pediatric research 80.6 (2016): 837-843. Mohamed, Faez Amokrane Nait, and Fatima Laraba-Djebari. “Development and characterization of a new carrier for vaccine delivery based on calcium-alginate nanoparticles: Safe immunoprotective approach against scorpion envenoming.” Vaccine 34.24 (2016): 2692-2699. Tebaibia, Amar, Mohammed Amine Boudjella, Djamel Boutarene, Farouk Benmediouni, Hakim Brahimi, and Nadia Oumnia. “Incidence, clinical features and para-clinical findings of achalasia in Algeria: Experience of 25 years.” World journal of gastroenterology 22, no. 38 (2016): 8615. Masdoua, N., L. Boublenza, H. Hassaine, J. Ngou, A. Nahet, M. Segondy, F. Razik, D. Regagba, N. Sadouki, and D. Mouhammedi. “Characteristics of HPV infection in women at risk in Western Algeria.” Medecine et maladies infectieuses 47, no. 1 (2017): 38-41. Djilali, B., Sarra, B., & Abdesselem, B. (2016). Proposal of a new model for the Algerian companies to measure the effect of intellectual capital on organizational performance. International Journal of Business and Administrative Studies, 2(5), 129-142. Sehili, Farida, Youcef Chennaoui, and Said Madani. “The Hqdil Method to Assess the Sustainability of an Historic Center Case of Mansourah K’bira (Algeria).” Procedia-Social and Behavioral Sciences 216 (2016): 570-577. Boudaren, Mohamed El Yazid, and Wojciech Pieczynski. “Dempster–Shafer fusion of evidential pairwise Markov chains.” IEEE Transactions on Fuzzy Systems 24.6 (2016): 1598-1610. Chakri, Asma, Rabia Khelif, Mohamed Benouaret, and Xin-She Yang. “New directional bat algorithm for continuous optimization problems.” Expert Systems with Applications 69 (2017): 159-175. Ouchen, Sabir, Achour Betka, Sabrina Abdeddaim, and Abdelkrim Menadi. “Fuzzy-predictive direct power control implementation of a grid connected photovoltaic system, associated with an active power filter.” Energy Conversion and Management 122 (2016): 515-525. Fezza, Sid Ahmed, and Mohamed-Chaker Larabi. “Perceptually driven non-uniform asymmetric coding of stereoscopic 3D video.” IEEE Transactions on Circuits and Systems for Video Technology (2016). Karabadji, Nour El Islem, Hassina Seridi, Fouad Bousetouane, Wajdi Dhifli, and Sabeur Aridhi. “An evolutionary scheme for decision tree construction.” Knowledge-Based Systems 119 (2017): 166-177. The laureates will be awarded a commemoration plaque bearing the name of the authors, the paper’s title and the year of the award. Additionally, each author on the winning and honourable mentions papers will receive a certificate. The winners from each discipline will also be given the excellent opportunity to be featured in an exclusive interview on Inspire Magazine, the first Algerian magazine dedicated to scientific outreach in english, to discuss and further disseminate their work. Most importantly, the winning and honourable mention papers would receive the recognition, celebration and further dissemination of their work by the wider community of academics and scientists worldwide. 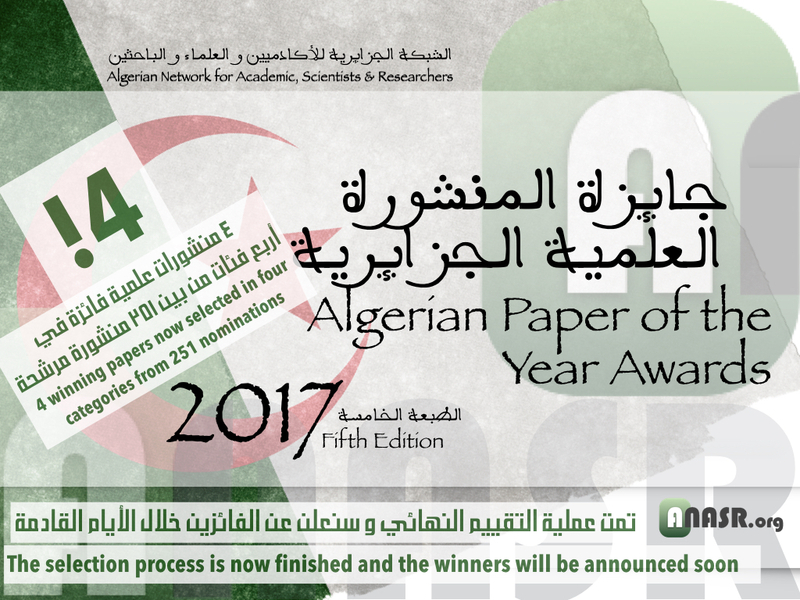 Previous laureates of the Algerian Paper of the Year Awards have used this recognition to forge new collaborations, including research visits to the US, and to boost their academic profiles back home. Why you should enter the awards competition? The Algerian Paper of the Year Awards offer an opportunity to promote your work whether you are a runner up or the ultimate winner in your discipline. Your work will be reviewed by high caliber experts in your field of research from renowned universities and so will benefit from a constructive reviewing process. An article about all the finalists will appear on Inspire Magazine and the follow-up interviews will further promote the work of the awards laureates to national and international readership, therefore increasing the recognition and visibility of their work, its impact, and open up avenues for potential collaborations with peers from around the world. As with previous editions, it has been a long but a very satisfying process for us, and an absolute pleasure to receive all these papers and to explore and discover the many wonderful work done by our colleagues in Algeria. We would therefore like to take this opportunity to thank everyone who nominated their papers for this year’s edition of the Algerian Paper of the Year Awards, everyone who helped with shortlisting and reviewing, and everyone who helped with donations, and we hope that you continue to be support anasr.org and it’s future initiative. All inquiries should be addressed to: awards@anasr.org. سعيد جدا بعد فوزي في مسابقة المنشورة العلمية الجزائرية لسنة2017، فذلك شرف لي ولجامعة العربي التبسي تبسة، كما أتقدم بالشكر للفريق المشرف على إعداد مثل هذه المسابقة المحفزة للباحثين والأكادميين على الإبداع والنشر. ودمتم في خدمة العلم والمعرفة . Thanks a lot of this intiative. I would like to ask how to apply for The Algerian Paper of the Year 2018 Awards.